Blogging is not so easy!! I had these very thoughts when I first started out just three months ago. Until I found this course on affiliate marketing. Affiliate marketing is when you try to earn money by placing an affiliate link on your website or social media account, etc. and have people purchase a product through your link. 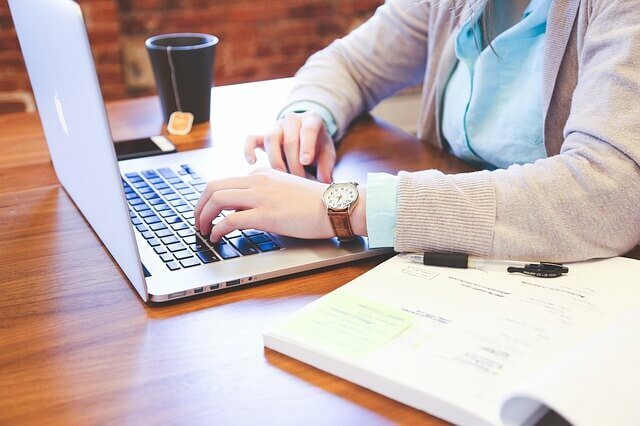 This course gave me an insight about everything I needed to know about blogging so that I was off to a great start right from the beginning. Many bloggers and online influencers skip over affiliate marketing. They either think it’s too hard, that it’s a waste of time, that they will turn readers away, or that their readers just won’t be interested. This is really not true. Blogging is a great source for making passive income. I never thought it would be possible, but I am so glad I purchased this course. Plus, I know many bloggers who are making a great living online. TRUST me, I know how you feel. When I started out blogging, I knew NOTHING about it. Due to that, I was afraid to try new things. I was definitely afraid of affiliate marketing because I didn’t want to waste my time. “Michelle” earns over $50,000 a month through affiliate marketing. 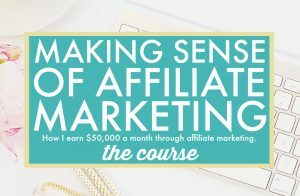 How she shares all of the best tips in this course on affiliate marketing. This book has played the role of a game changer in my life. It has shown me a whole new world where I could explore, and write about my discoveries to my heart’s content. I have got so much from the exclusive Facebook group that comes with this course, that I make it a point to peek into the group everyday. There are more than 2K established bloggers who are ready to walk you through any difficulty you might face when setting up you blog. And all have to do is ask! Check out Making Sense of Affiliate Marketing TODAY!! you are actually a good webmaster. The site loading velocity is amazing. It kind of feels that you’re doing any distinctive trick. Also, The contents are masterwork. you’ve done a excellent activity in this topic! Thank you so much Lola. Encouragements mean a lot when you are working so hard to make a blog of your dreams.The webmaster mastermind is actually my hubby who has put in a whole lot of effort on this wee little blog even after slogging away 60 hours a week in this multinational company that he is a part of. Wow, marvelous blog layout! How lengthy have you been running a blog for? you made blogging glance easy. The whole glance of your web site is magnificent, let alone the content! I’m impressed, I should say. Really rarely do I encounter a blog that’s both educative and entertaining, and let me tell you, you’ve hit the nail on the head. Your idea is outstanding; the concern is one thing that not sufficient folks are speaking intelligently about. I am extremely content that I stumbled across this in my search for something relating to this. I was speaking to a friend of mine regarding this article and also about best espresso machine as well. I do believe you made a number of good points in this case, we’re also looking forward to keep reading information from you. You are totally correct! I enjoyed looking through this and I will come back for more right away. My website is about garageband free download, you might check it out if you are interested in this. There are certainly amazing improvements on the layout of the webpage, I really like that! My website is regarding cable modem router and currently there are plenty of things to be done, I’m currently a newcomer in web page design. Take good care! Hello could you let me know which blogging platform you are working with? I am going to begin my own personal website on college homework help in the future but I’m having a difficult time choosing. Thanks for the amazing article! I definitely enjoyed reading it.I’ll be sure to take note of your page and definitely will come back from now on. I would like to suggest that you keep going with your excellent work, perhaps write about homework help also, have a fine day! Thanks a bunch for this marvelous content! I truly enjoyed finding out about it.I will make certain to save your page and definitely will return from now on. I want to suggest you to definitely continue your excellent job, maybe try to think of kik messenger too, have a superb day! Thank you so much kik. Great you enjoyed the post. Hello I’m so grateful I came across your blog page, I basically encountered you by mistake, while I was looking on Google for kik for windows. Anyways I’m here right now and would really love to say thanks a lot for a great article and the all-round fun blog (I likewise enjoy the design), I do not have sufficient time to look over it completely at the minute though I have bookmarked it and moreover included your RSS feed, so whenever I have plenty of time I will be returning to look over a great deal more. Make sure you do continue the wonderful job. You’re completely right! I really liked reviewing this and I will come back for more as soon as possible. Our website is about shareit for pc, you can take a glance if you are still interested in this. Hi. I just came across this excellent website and I really enjoy it. I also always like to discuss malpractice law firms from time to time. Great to be here, thanks a lot! Hello, I am really excited I found out your site, I actually encountered you by accident, while I was looking on Digg for best medical negligence lawyers. Regardless I am here now and would really love to say thank you for a tremendous write-up and the overall interesting blog (I likewise love the theme), I don’t have enough time to look over it entirely at the minute yet I have book-marked it and moreover added the RSS feeds, so once I have the time I will be returning to look over more. Please do maintain the awesome job. I personally came over here via another web address on the subject of omega xl price and thought I might as well check out this page. I quite like what I see thus now I”m following you. Looking forward to exploring your website all over again. Hey there could you inform me which blogging platform you are making use of? I am planning to start out my personal website on phone number locator in the future though I am having difficulty making a choice. This is an area keep hearing about and know nothing about! I really need to get to grips with it though. Thanks I will be going through your site carefully for more tips! Great. You are always welcome. You have brought up very good details, regards for the post. Thank you. Check your inbox for the affiliate link. Admiring the hard work you put into the site and in depth info you provide. It’s nice to discover a site once in a while which is just not the same out of date re-written material. Great read! We have bookmarked your webpage and I’m adding the RSS feeds to my own auto accident attorney page.